Download "Outlook 2011 Window. [Day], [Work Week], [Full [Home]. Schedule and plan: Click the [New"
2 Message Window Ribbons About the Message windows: The Ribbon you see changes according to whether you re creating or responding to a message or have a message open for reading. 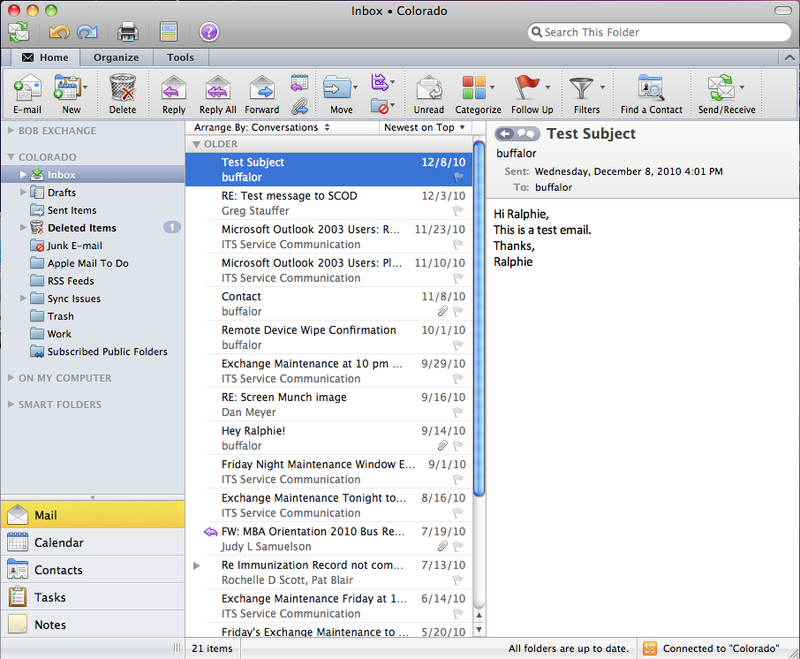 Tip: To hide the Ribbon in any Outlook window, press Option+Command+R. Note the options in the Menu bar are available regardless of the state of the Ribbon. You can select commands from a drop-down menu or the Ribbon. New Message Read Message Messages: Basic Tasks Access the Inbox: Click the Mail button in the Navigation pane and then click Inbox in the list of mail folders. Read a message: If not already open, select the mail folder. Click a message to preview it, or double-click to open it. Open an attachment: Select the message. Click to view the file in a separate preview window, or double-click the attachment name to open it in its native application. Reply to message: First select the message and then click [Reply]. Type your response, and click [Send]. If the message is open, simply click [Reply] and continue as above. Reply to all recipients: Same as replying, except click [Reply to All]. Forward a message: Same as replying, except click [Forward Message]. Delete a message: Select the message and click [Delete]. Create a new message: Click [New ] on the Home tab. Fill in the To and CC fields, or click [Contact Search] to look for a name in the address book. Add a Subject, type your message and then click [Send]. Add an attachment: Click on the Message tab. Navigate to the file you want and then click. Send a blind carbon copy: Type an address in the Bcc: field in the message header or click [Contact Search] to look for the name. Tip: If you don t see the Bcc field, select the Options tab and then click [Show BCC]. Save a message as a draft: Compose the message and then click [Save] in the Quick Access toolbar to move the message to the Drafts folder. Message indicators: These icons may appear next to a message: Messages: Advanced Tasks Flag a message To-Do: Select the message. From the Home tab, click [down arrow] on [Follow Up] to display a contextual menu of choices. To clear a flagged message, select Clear Flag from the contextual menu. Color categorize a message: Select the message. From the Home tab, click [down arrow] on [Categorize] to display a contextual menu of choices. Move a message: Select the message and click [down arrow] on [Move]. If you don t see the folder you want, select Choose Folder and navigate to the one to use. Tip: To move a copy of a message to another folder, select Copy Message instead. Empty deleted items folder: Select the Tools tab, and click [down arrow] on [Schedules] to display a contextual menu of choices. Select Empty Deleted Items Folder. Create a contact group: Formerly called a distribution list. From the Home tab, click [down arrow] on [New]. Select New Contact Group from the contextual menu. In the new window, type a name for the group and then click names to include. [Add] to begin entering Create a signature: From the New Message window, click [down arrow] on. Select Edit Signature from the contextual menu and then click to add a new signature, or else select one of the existing signatures to edit. Tip: You also can access Signatures from the Outlook > Preferences menu. Use the Rules Wizard: From the Home tab, click [down arrow] on. Select Edit Rules from the contextual menu then select the account (e.g., Exchange). Click to add a new rule. Define the criteria and associated actions in the new dialog box. Message has not been read. Reply has been sent. Message has been forwarded. File is attached to the message. Message is high priority. Message is low priority. Turn on Automatic Replies: From the Tools tab, click [Out of Office]. Use the Out of Office Assistant that appears to add an response to new messages and to indicate start and end dates. Select message options: When the New Message window is open, there are various tools for working with messages on the Options tab. These include: [HTML on/off], [Permissions], [Security], [ Scrapbook], [Reference], and [Spelling]. Click the desired button to see available options. 4 The Ribbon In Outlook 2011 the ribbon shows tools for all tasks. Customizing the Ribbon: You CAN T: You CAN: Add, rearrange, or remove Minimize the Ribbon commands Customize the Quick Change or remove groups Access Toolbar (click the down arrow to the right of the Toolbar, then select More Commands) MAIL: Advanced Tasks Quick Access Toolbar Ribbon Tabs Groups Outlook 2011 Quick Reference Guide To Save a Message as a Draft: While composing a message, click Save on the Quick Access Toolbar. The message appears in the Drafts folder. To Resend a Message: Double-click to open the message in the Sent Items folder. Click on the Forward button and type in the address, then click Send. To Change Message Options: While composing a message, click the Options tab on the Ribbon. Here, you can specify: o Permissions o Security To Create a Signature: o Format o Background When composing a message click the Signature button. Click Edit Signatures... Click the + to create a new signature. Name the Signature and then type the text that you would like for your signature and then close the window. To insert your signature select it from the Signature button drop-down menu. To use a different signature select a different signature from the Signature button drop-down menu. To Categorize a Message by Color: With the message selected in the Folder Pane click the Categorize button from Standard toolbar, and select a Color Category. To Rename the Color Category: Click Categorize on the Standard toolbar, and select Edit Categories... Double-click the name of the category to be changed and rename it what you would like it named. To Search a Folder: With the folder selected that you would like to search, type in your search terms into the search box labeled Search This Folder, then hit the <Enter> key. To Create a Contact Group: On the Standard Toolbar click on the New drop-down menu and then select Contact Group. To add contacts click the Add button and type in the information for the person that you would like to add. You can also double-click in an empty space to create a new entry. If you are content with this contact group click Save & Close. To Send to a Contact Group: While composing a message, click the Address Book icon. Search for the name of the group and then click To, Cc, or Bcc to send an to the group that has been selected. To Edit a Contact Group: Click on the Contact Search button from the Standard toolbar. Search for the desired group and double-click the group. Use Add and Remove to edit the group. Click Save & Close from when done. Flag a Message as a To-Do Item: Select the message in the Folder Pane, click the Follow Up button on the Standard toolbar, and select a flag. To Clear a Flagged Message: Select the message in the Folder Pane, click the Follow Up button on the Standard toolbar, and select Clear Flag. CREATING A VACATION MESSAGE Creating a Vacation Message: From the Tools tab in the Ribbon click Out of Office. To turn ON: select Send Out of Office messages. o Auto-replies begin immediately unless you specify Start / End dates. o Type the message to be sent in the Reply to messages with: box. o The Reply to each sender outside of my company with: box: This message is optional. If you would like to send it, create the message AND Activate by clicking the Send replies outside of my company to: checkbox. Select recipients: Address book Contacts only or Anyone outside my company. To turn OFF: select Do not send Out of Office messages. SPAM CONTROLS Controlling SPAM: In order to reduce the number of false positives, ITS recommends that you allow the Server to filter your instead of using the spam filters available on individual mail clients. To do this, you must turn off the spam filters in your mail client which are set to On by default. o From the Junk drop-down menu select Junk Protection... o In the Junk Options dialog, Level tab, click to select None, Turn junk protection off. 5 THE OUTLOOK 2011 CALENDAR Outlook 2011 Quick Reference Guide Ribbon Standard Toolbar Date Navigator My Calendars List Calendar Pane To view the Calendar click the Calendar button. Status Bar CALENDAR: Basic Tasks To Create an Appointment: Click on the Appointment button or double-click anywhere in the Calendar to get a new Appointment Window. (shown to the right) o Enter a Subject and Location for the Appointment. o Select Start and End times. o Add related information in the text box. o Click Save & Close in the Actions group on the Ribbon. To Delete an Appointment: Click the Appointment in the Calendar Pane, then click Delete on the Standard toolbar. To Color Code an Appointment: Click the Appointment in the Calendar Pane, click Categorize in the Standard Toolbar, and select a Category. To Change the Length of an Appointment: Double-click the Appointment and change the Start or End time. 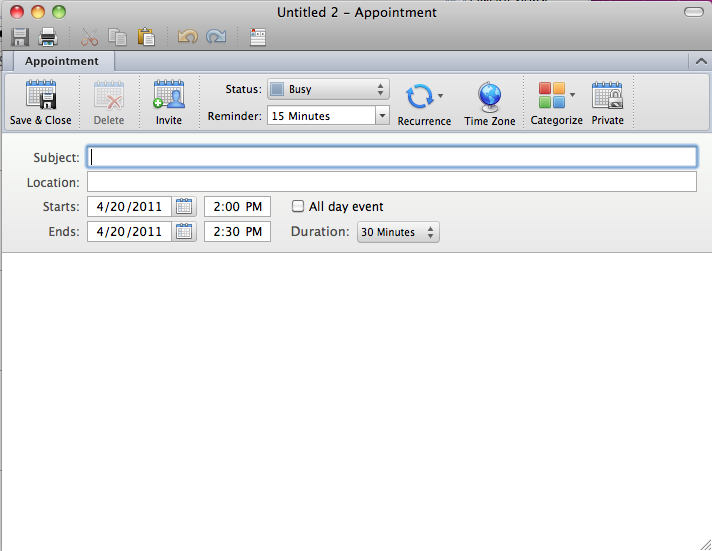 To Change Date/Time of an Appointment: Click on any part of the Appointment in the Calendar Pane. Hold down the left mouse button and drag the Appointment to the desired date/time. Or, double click the Appointment, and change the Start and End dates/ times. To Create a New Calendar: From the Organize tab in the Ribbon click New Calendar... Give the new Calendar a name such as Personal, Resource, Seminars, etc and hit the <Enter> key. The new Calendar appears in your My Calendars list in the Navigation Pane. To View Different Dates: Click on the desired date in the Date Navigator. The new dates appear in the Calendar Pane. To Go to Today: In the Standard Toolbar click Today. To Change Dates Displayed in Date Navigator: Click the arrows to either side of the month at the top of the Date Navigator. To Change Views: Click Day, Week, or Month located on the Standard toolbar for different views of your Calendar. View Multiple Calendars: Click on the checkbox next to the calendars you would like to view in your My Calendars list. The Calendars will appear side by side in the Calendar Pane. 6 The Calendar Ribbon Meeting/Appointment Windows Outlook 2011 Quick Reference Guide In the Appointment and Meeting windows, the Ribbon will show Meeting related actions. MAIL: Advanced Tasks Create a Meeting Request: Click the Meeting button from the Standard toolbar, or click the Appointment button and then click on Invite. o Set up: Fill in the Subject, Location, Date and Time. o Invite Guests: Click the Address Book icon and search for the contacts Guests you would like to invite, or type the in the To: field. Click Required or Optional to add the selected names to that group. Close the contact search window when finished. o Additional Information: If desired, add additional information by typing in the text box or attaching files, business cards, tables, or illustrations from the Insert Tab. o Request an RSVP: If desired, on the Request Response icon located to the right of the Recurrece icon. o Send: Click Send to send the invitation to the Invitees. To View Invitee Schedules: To find times when everyone is available, add Invitees to the Meeting as described above. Click Scheduling Assistant tab on the bottom of the Appointment window. o Use the scroll bar under the Attendee list to view different dates. o An Attendee s row will be blocked when they are NOT available. o Adjust Start/End times at the bottom of the Scheduling window. o When finished, click Message tab to return to the Meeting details and the message to be sent. To Add/Delete Guests: Double click the Meeting to open it. Click Scheduling Assistant as described above. Invite additional guests as described above. Remove guests by deleting them by clicking on the name in the To: field and hitting the <Delete> key. To Cancel a Meeting: Open the meeting by double-clicking it. Click Cancel Meeting, then click Send Cancellation. To Reschedule or Update a Meeting: Double-click the Meeting, make your changes, then click Send Update. To Respond to a Meeting Request: Meeting Requests arrive in the Mail Inbox. Double-click the Meeting Request to open it. Click on one of the Responses located at the top of the request and select how to respond. To Track Response: Responses wil be sent to your once people have selected whether or not to attend. To Create a Tentative Meeting: Create a meeting as usual. Before sending, click the Status box and select Tentative. Complete and Send the Meeting Request. The Meeting will appear with a striped border in the Attendees calendars until the Tentative option is removed. To Create Recurring Meetings: While creating a Meeting, click Recurrence. Select how often you would like for the meeting to reoccur or select Custom... to create a unique schedule. Complete and Send the Meeting Request. To Share Your Calendar: Right-click on the calendar you would like to share and selct the Share Permissions option. o When this new window opens select Add User... o Search for the person, select their name and click OK. o Click OK again to share your Calendar. To View Shared Calendars: Once granted permission to see a Shared Calendar, that Calendar will appear in your My Calendars List in the Navigation Pane. Click on the Shared Calendar to view it. CONTACTS To View Your Contacts: In the Navigation Pane click Contacts. To Create a New Contact: From the New menu select Contact, or from within the Contact section click Contact. To Edit a Contact: Double-click the contact. To Find a Contact: Type the contact to search for in the Find a Contact box. To Delete a Contact: Select the contact and press the <Delete> key. TASKS To View a Task: Your Tasks for each day appear in the Task section, found in the Navigation Pane. Double-click the task to view the details. To Work with Tasks: Click Tasks in the Navigation Pane to enter Task View. To Create a New Task: From the New menu select Task, or from within the Task section click Task. To Complete a Task: In Simple List view, check the task s check box. To Delete a Task: Select the task and press the <Delete> key. To Create a Recurring Task: Double-click the task and click Recurrence, then define how often the task will reoccur.